The Trail traverses some of the most spectacular areas of the badlands of North Dakota. It crosses the Little Missouri River twice, and covers high ridges to deep drainages and rough badlands to rolling prairies. Scenic areas are the midway marker of the original MDHT at MP97, Devils Pass at MP102 and the China Wall at MP130. The Maah Daah Hey Trail connects CCC Campground on the north end to Burning Coal Vein Campground on the south end. 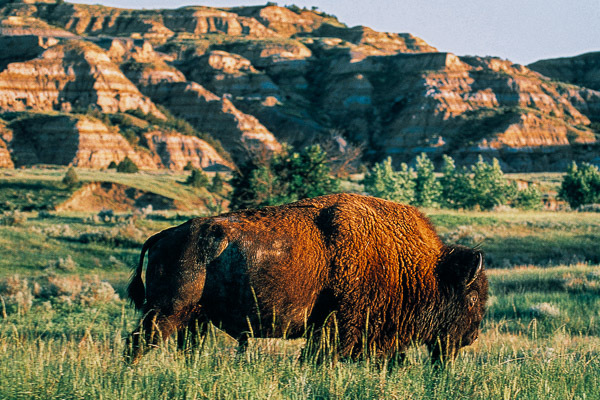 It traverses areas managed by the Forest Service and includes some state and private land, along with sections managed by Theodore Roosevelt National Park (TRNP). Bikes are not allowed on the trail inside the TRNP. Please stay on the Trail when on private and state lands (entry and exit signs on state and private lands are posted). Camping can be done within designated campgrounds or on Forest Service managed lands. hiking, biking and horse riding in all types of terrain in western North Dakota, day or week long hikes are possible on this trail.